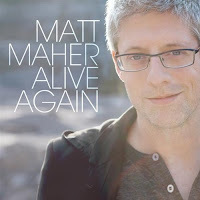 Matt Maher: Life-Changing New Album 1 : Reform worship. I don't highly recommend too many albums. They have to come into my life at just the right time, meaning, the creativity and content offered by the artist and producer must resonate deeply with what the Spirit is doing in me. Sometimes I don't "get" what the artist is presenting when I first listen to it, and only later (sometimes years later) am I in the place spiritually where I can truly take it in. Or sometimes the art itself opens my eyes to something beautiful that I would not have otherwise seen. And sometimes the art is really bad, and I have nothing to glean from it and never will. Note that I don't listen to a lot of music, let alone entire albums straight through. That said, there have been two albums this year that have transformed my life. I have already mentioned one, The Now and Not Yet by Jeremy Riddle. The other has only been in my soul for a week, and I am already a new man. All I knew of Matt Maher before picking up his new album was that he is a Roman Catholic and that he wrote "Your Grace Is Enough," a song of which our church has had enough. I knew that Chris Tomlin had popularized it and took off the ever-necessary prepositional phrase "of Jacob" from the verses. Then my good friend Micah posted about Maher's new album, so I had a listen. I was impressed enough by the iTunes snippets that I purchased it. And boy am I glad I did! Matt Maher has a heart like David's. He knows what it means to "dwell in the house of the Lord," and not only that, but it's obvious he personally and regularly experiences the presence of the Lord, gazing upon His beauty and being held in His arms. He is one satisfied dude. This is what I want, and this is what God is beginning to unfold in my life. Matt is helping me. At the risk of losing some of you, I will end this post here. However, I will review the album in a second post and take a third post to expound upon how this work of art is changing my life. For now, I highly recommend purchasing this record and letting it begin its work in your heart. Ya he's got some cool stuff- thanks for sharing this Ryan! Ryan, It is uncanny that you posted this today. Just two days ago I was looking at a conference for Catholic students that will be in Florida during the Christmas break and he is one of the musicians for the conference. Tim Hawkins is the comedian and Matthew West is also a musician on the schedule. The conference is @ focusonline.org. Hello from Worcester, MA. My name is Eric and we met out at the Asheville, NC worship leaders retreat. I was with my friend Ben who worships on my team at the Woo Vineyard church in Worcester. Anyways, thank you for this post. I really appreciate being introduced to solid worship music. So much of the stuff out in the "worship" genre lacks the power to provoke thought and reflection. I look forward to giving this a listen.